Are you doing everything you can to protect yourself from skin cancer? Sunscreen…check. Hat…check. Sundots…no? Yes, you need to get Sundots! Sundots are chewable gummies, about the shape of those Dots candies but less gummy and less sweet, that contain an organic fern extract called polypodium leucotomos. Research demonstrates that this active ingredient has antioxidant and photoprotective properties and exhibits a strong anti-aging effect. 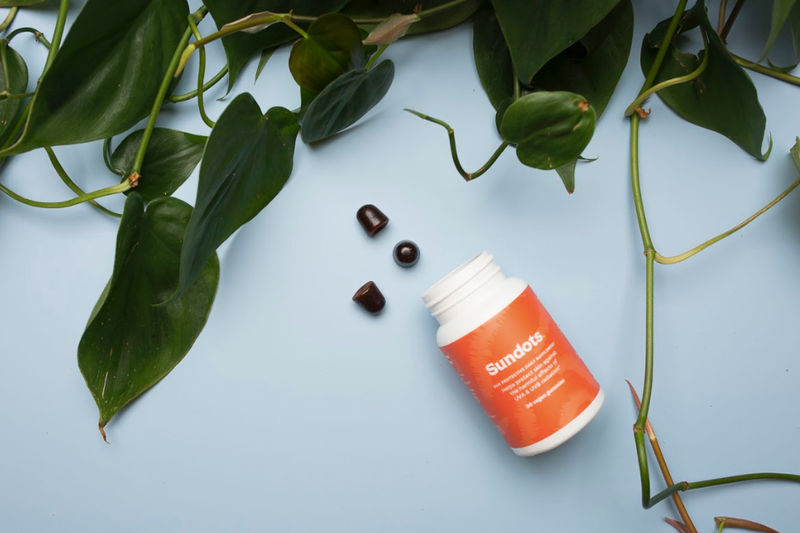 You’ll see these benefits in as little as 2 hours after ingesting, and they built up over time, so it’s important to take Sundots daily with a second gummy at midday if you’re going to be out in the sun a lot like heading to the beach or out hiking all day. It’s not meant to replace all that you do to protect your skin from the sun, but as a supplement to your usual routine of sunscreen, hat, and sun protective clothing. Plus, Sundots have the added benefit of 100% of your daily recommended dose of Vitamin D, a common vitamin that many people are deficient in which is linked to poor bone health. For a novel approach to sun protection from within, remember your daily dose of Sundots!